Hyponatremia is a common water balance disorder that often poses a diagnostic or therapeutic challenge. Therefore, guidelines were developed by professional organizations, one from within the United States (2013) and one from within Europe (2014). This review discusses the diagnosis and treatment of hyponatremia, comparing the two guidelines and highlighting recent developments. Diagnostically, the initial step is to differentiate hypotonic from nonhypotonic hyponatremia. Hypotonic hyponatremia is further differentiated on the basis of urine osmolality, urine sodium level, and volume status. Recently identified parameters, including fractional uric acid excretion and plasma copeptin concentration, may further improve the diagnostic approach. The treatment for hyponatremia is chosen on the basis of duration and symptoms. For acute or severely symptomatic hyponatremia, both guidelines adopted the approach of giving a bolus of hypertonic saline. Although fluid restriction remains the first-line treatment for most forms of chronic hyponatremia, therapy to increase renal free water excretion is often necessary. Vasopressin receptor antagonists, urea, and loop diuretics serve this purpose, but received different recommendations in the two guidelines. Such discrepancies may relate to different interpretations of the limited evidence or differences in guideline methodology. Nevertheless, the development of guidelines has been important in advancing this evolving field. Diagnostic algorithm for hyponatremia. Based on the European guideline.7 ECF, extracellular fluid. Enzymatic cleavage of the vasopressin prohormone produces not only vasopressin, but also neurophysin and copeptin (also called C-terminal proarginine vasopressin).51 Because copeptin is more stable, it can be measured more easily. Copeptin can therefore be used as a surrogate marker for vasopressin. Although both guidelines only briefly discuss copeptin, emerging data justify a brief discussion on the diagnostic utility of this novel marker. Fenske et al. found that plasma copeptin levels were higher in patients with hypo- or hypervolemic hyponatremia than in patients with SIAD.52 This was demonstrated previously35 and likely reflects an “osmoreceptor gain,” the phenomenon in which angiotensin II amplifies vasopressin release in the context of a low effective arterial blood volume.53,54 Because hypovolemic hyponatremia is characterized by high plasma copeptin and low UNa, the plasma copeptin to UNa ratio may be especially useful to differentiate it from SIAD. Although the study by Fenske et al. did indeed demonstrate this,52 the specificity of copeptin/UNa for SIAD in a more recent and larger study was less high.31 An interesting approach was the use of plasma copeptin to differentiate SIAD subtypes.55 Using hypertonic saline, SIAD subtypes were defined on the basis of their relationship between serum osmolality and plasma copeptin (Figure 2). As expected, low plasma copeptin levels are diagnostic for hyponatremia due to polydipsia.31,52 Arguably, the need for a novel diagnostic marker for this cause of hyponatremia is limited, as it is usually obvious from the clinical setting and the low UOsm. In addition to plasma copeptin, two additional circulating markers were recently evaluated in patients with hyponatremia, including apelin and midregional proatrial natriuretic peptide (MR-proANP).56,57 Physiologically, apelin and vasopressin are regulated in opposite directions by volemic and osmotic stimuli.56 Apelin not only inhibits vasopressin release centrally, but also counteracts the antidiuretic effect in the kidney.58 However, in patients with hyponatremia due to SIAD or heart failure, plasma apelin was insufficiently suppressed, possibly contributing to antidiuresis in these settings.56 Similar to plasma copeptin, MR-proANP levels were higher in patients with hypovolemic or hypervolemic hyponatremia than in patients with SIAD (although these levels were still higher than in healthy subjects).57 High MR-proANP in hypovolemic hyponatremia is counterintuitive, but may be explained by lower GFR secondary to volume depletion.59 Although plasma copeptin, apelin, and MR-proANP increase insight into the pathophysiology of hyponatremia, the true diagnostic potential of these parameters remains to be determined. In addition, one single parameter is unlikely to achieve optimal discriminatory power. A relevant question is whether a combination of diagnostic parameters might improve management. Copeptin-based classification of five subtypes of the syndrome of inappropriate antidiuresis (SIAD). The shaded gray area and the black dashed line show the normal physiologic relationship between serum osmolality and plasma copeptin (as surrogate marker for vasopressin). In SIAD type B this relationship is intact, but the osmotic threshold for vasopressin release has decreased. In SIAD types A and C vasopressin release is no longer regulated by serum osmolality. In SIAD type D plasma copeptin levels are undetectable. In SIAD type E the normal relationship between serum osmolality and copeptin has reversed. This phenomenon has been coined “barostat reset,” as it may indicate increased sensitivity of baroreceptors to increased vasopressin release. Percentages indicate how often each subtype was present in one study of 50 patients. Data on the basis of Fenske et al.55 and figure modified from Fenske et al.116 with permission. Several settings predispose to acute hyponatremia, especially if combined with increased free water intake.71 Among others, these include the postoperative period, exercise, and the use of 3,4-methylenedioxymethamphetamine (“Ecstasy”), haloperidol, thiazide diuretics, desmopressin, oxytocin, or intravenous cyclophosphamide.71–74 A specific situation is the use of irrigants (glycine, sorbitol, mannitol) during transurethral or hysteroscopic procedures. Although absorption of the irrigants glycine and sorbitol may cause hypotonic hyponatremia, the degree of hypotonicity and therefore the risk of cerebral edema depends on the type of irrigant and the time course in osmolar shifts.75,76 In contrast, mannitol causes hypertonic hyponatremia without a risk for cerebral edema. In daily practice, the distinction between acute and chronic hyponatremia is difficult, because the time in which hyponatremia developed is usually unknown. The United States and European guidelines approached this challenge differently. The United States guideline adhered to acute versus chronic hyponatremia, but did subdivide acute hyponatremia on the basis of the presence of severe or mild-to-moderate symptoms (Table 2).9 The European guideline based its recommendations primarily on the presence and severity of symptoms rather than on duration.7 Both guidelines recommend hypertonic saline (typically 3% NaCl) for acute or symptomatic hyponatremia.7,9 Hypertonic saline is an effective and potentially life-saving treatment for cerebral edema due to hyponatremia, as the high extracellular sodium concentration immediately removes water from the intracellular space. In patients with hypervolemic hyponatremia, hypertonic saline may be combined with loop diuretics.9 The required volume of hypertonic saline to reach a predefined increase in SNa can be estimated using the Adrogué–Madias or Barsoum–Levine formulae.77,78 Although predictions with these formulae are fairly accurate,66 a switch toward giving hypertonic saline as fixed bolus has occurred in recent years.79 No studies have systematically tested this approach, but there are a number of appealing aspects. First, especially in patients with cerebral edema, it is desirable to achieve a rapid partial correction in SNa. Second, a fixed bolus omits the need for calculations in a patient with an acute problem, limiting potential calculation errors. Third, bolus therapy limits the risk of overcorrection, which does occur commonly with a continuous infusion of hypertonic saline.80 On the basis of these considerations, both guidelines recommend bolus therapy, albeit with slightly different specifications (Table 2).7,9 Recently, Ayus and colleagues reported their experience using a different protocol (500 ml 3% NaCl over 6 hours) in 64 patients with hyponatremic encephalopathy (SNa<130 mmol/L and neurologic symptoms).81 On average, this protocol increased SNa with 12 and 14 mmol/L in the first 24–48 hours, and improved symptoms without evidence of ODS.81 However, the severity of hyponatremia (SNa frequently <110 mmol/L) and the duration of symptoms suggest that some of these patients had chronic hyponatremia. If so, these correction rates would exceed currently recommended limits (Table 2). Except for hypovolemic hyponatremia, the treatment of chronic hyponatremia relies on reducing free water intake and/or increasing renal free water excretion (Table 2). Fluid restriction (<1 L/d) is often the cornerstone of the therapy for chronic hyponatremia.24 The urine to serum electrolyte ratio ([UNa + urine potassium concentration]/SNa) indicates if the patient is in an antidiuretic or aquaretic phase, and can also help estimate the degree of fluid restriction required to increase SNa.3,11,24,82 For patients with a ratio>1 (indicating concentrated urine), <500 ml fluid/d is recommended, which is difficult to adhere to. Winzeler et al. recently showed that in patients with SIAD fluid restriction is effective in 59% of patients.83 Predictors of nonresponse were a UNa≥130 mmol/L and UOsm≥500 mOsm/kg.83 This implies that in patients with chronic hyponatremia pharmacologic therapy is often required to increase renal free water excretion. This can be achieved by treatment with loop diuretics, urea, vasopressin receptor antagonists (“vaptans”), or demeclocycline. The two guidelines diverge in their recommendations regarding pharmacologic therapy for SIAD and hypervolemic hyponatremia (Table 2). This was the case especially for vaptans, which will therefore be discussed in more detail below. Vaptans block vasopressin type 2 receptors in collecting duct principal cells and therefore induce aquaresis (for comprehensive review, see Berl,84 Hoorn and Zietse,85 Lehrich et al.,86 Rozen-Zvi et al.,87 and Greenberg and Verbalis88). Several vaptans were developed, including tolvaptan, satavaptan, lixivaptan, and conivaptan (which also targets vasopressin type 1a receptors). On the basis of their mechanism of action, vaptans are a logical and targeted therapy for hyponatremic patients with excess vasopressin. Indeed, several large clinical trials have shown that vaptans are clearly effective in increasing SNa in patients with hyponatremia due to SIAD, heart failure, or liver cirrhosis.89,90 Both guidelines agree that there is no place for vaptans in patients with acute or severely symptomatic hyponatremia, for which hypertonic saline is the treatment of choice.7,9 Still, it has been difficult to position vaptans in the therapeutic arsenal of chronic hyponatremia.11,84,91,92 The United States guideline lists vaptans as one of the pharmacologic options, if fluid restriction has failed (Table 2).9 The European guideline did not recommend vaptans in moderate hyponatremia.7 The reason to do so was the absence of evidence for improved hard outcomes with correction of SNa. Meanwhile, one meta-analysis has suggested improved survival with correction of hyponatremia,93 although bias is difficult to exclude because no randomized controlled trials are available. Furthermore, there is evidence for potential harm of vaptans, including overcorrection, and liver toxicity.7,87,94–96 Because ODS has mainly been reported after overcorrection of profound hyponatremia, the European guideline recommended against vaptans in this setting.7 Recently, Tzoulis et al. reported “real-life experience” with tolvaptan in 61 patients with resistant hyponatremia due to SIAD.97 The average rise in SNa after 24 hours was 9.0±3.9 mmol/L. Excessive correction of hyponatremia (>12 mmol/L per day) was observed in 23% of patients (all with profound hyponatremia), although none of them developed signs of ODS.97 ODS was reported in one patient with heart failure in whom 15 mg tolvaptan caused SNa to increase from 126 to 142 mmol/L in the first day and to further increase to 187 mmol/L in subsequent days.94 On the other hand, improvement of symptoms has been shown with the use of vaptans. This includes improvements in some neurocognitive symptoms,98 performance status in cancer patients,99 dyspnea in patients with heart failure,100 and ascites in patients with liver cirrhosis.101 Therefore, in our view, an unresolved question with regard to the use of vaptans remains, of whether symptomatic improvement outweighs the risk of overcorrection, even if ODS is rare. 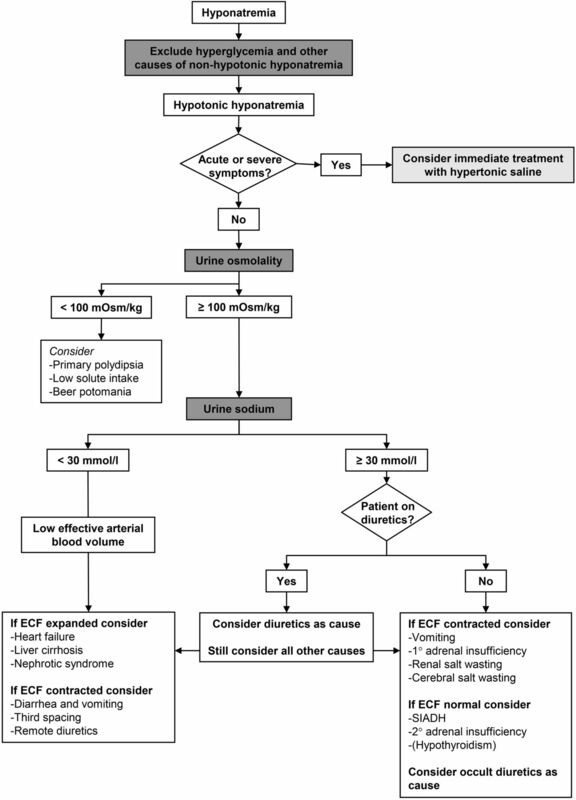 Both guidelines suggest an interesting alternative to vaptans for chronic hyponatremia due to SIAD, namely urea.102 Urea induces an osmotic diuresis, thereby increasing renal free water excretion. Decaux and colleagues pioneered the use of urea in the 1980s for SIAD, but also for other forms of hyponatremia.103–109 More recently, in 12 patients with SIAD, Soupart et al. compared the treatment with satavaptan to urea (both treatment periods 1 year).110 Interestingly, both therapies had a similar efficacy and side-effect profile. Although urea does not prevent overcorrection, it may reduce the risk of the associated brain damage. In a rat model of experimental SIAD, Gankam Kenge et al. compared the neurologic outcomes after overcorrection (approximately 30 mmol/L per day) with hypertonic saline, lixivaptan, or urea.111 Quite strikingly, neurologic scores and survival were better in the animals treated with urea. Histologic analysis showed that, in comparison to the two other treatments, urea reduced demyelination, microglial activation, and changes in the blood-brain barrier, and increased astrocyte viability.111 Although one should be careful to extrapolate these findings to humans, this may explain why patients with ESRD and hyponatremia do not develop ODS after treatment with hemodialysis.112 One specific disadvantage of urea used to be its palatability. This problem has been solved by developing a formulation in which urea is combined with sodium bicarbonate, citric acid, and sucrose (see European guideline for prescription7) and by the development of a commercially available urea powder drink mix (Ure-Na by Nephcentric). Our impression is that the development of the United States and European guidelines has helped to standardize and improve the management of hyponatremia. The two guidelines are more often in agreement than in disagreement. The discrepancies are likely related to the interpretation of the limited evidence and the methodology used to draft the guidelines.113 Nagler et al. evaluated all available international guidelines on hyponatremia and analyzed how well they met the Appraisal of Guidelines for Research and Evaluation criteria.114 They identified considerable variation in methodologic rigor in the development of guidelines, potentially explaining inconsistencies in recommendations.114 Because hyponatremia is a heterogeneous disorder rather than a clear-cut disease, not all patients can be covered by guidelines. That said, which evidence does the field need for the coming years? First, it would be useful to evaluate if a combination of the traditional and newer diagnostic tests would improve not only diagnosis but also outcomes. Second, the approach of giving a bolus of hypertonic saline should be studied to address the optimal volume, whether this should be on the basis of (ideal) body weight, and how often it should be repeated to reach the desired increase in SNa.115 Third, the role of vaptans in the treatment of chronic hyponatremia remains a logical focus. For example, it would be important to analyze whether the copeptin-based subtypes of SIAD respond differently to vaptans (Figure 2). Finally, studies analyzing the effect of a vaptan in comparison with another active treatment (rather than placebo) on patient-relevant outcomes (rather than SNa) are warranted. E.J.H. is supported by the Dutch Kidney Foundation (KSP-14OK19). Salt-Losing Tubulopathies in Children: What’s New, What’s Controversial?